The sunshine came and decided to stay awhile. So we thought, time to tidy the garden. It has been neglected well and truly. I mean look at this picture. It looks a shamble. 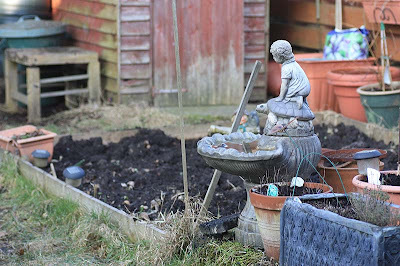 D worked on the clearing out the shed and turning the compost bin, whilst I got down and dirty with the garden plot and pots. The garden plot is about 10 foot by 8 foot. This is what I used to grow some of my salad leaves, lettuces, spinach and veg such as courgettes before I got the allotment plot, last year it was cavolo nero, shallots, onions and some chard, so that I could concentrate on the allotment plots. Not anymore as it is back to the garden plot. I am not exactly dressed for gardening, but once I was down there. I got stuck right into it. I dug out these spent plants, including Rainbow Swiss chard, perpetual spinach, and even the Rhubarb plant that seemed to have rotted. Last year I had managed to force it and have it with Greek yogurt, it was delicious. Not this year, unfortunately. 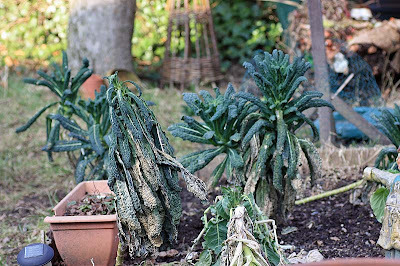 The cavolo nero aka black kale or black cabbage has been really successful. I'll be growing these again. During the clearing up I came across these thriving buds. I cannot remember what they are - so am looking forward to the surprise and the colours. 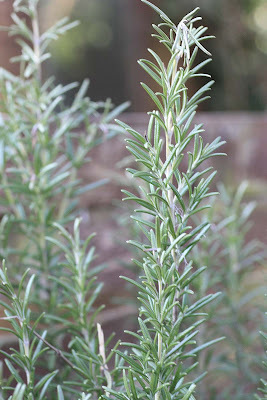 and the evergreen rosemary. Others are still sleeping like the chives and mint, but I no longer have lovage, lemon balm, lemon verbena - these will all have to be replaced in the near future. Ah for those of you who have seen a peek of me, will note that I have had a haircut. Its actually quite a drastic haircut for me. I think the last time I had it this short was when I was three or four years old. I know, because I have a picture of me looking rather cute. I'm getting used to it, especially the cold breeze on the back of my neck, I miss my long hair especially when its cold as it sometimes served as a 'natural scarf'. Clearing the weeds from some of the pots also revealed new shoots. This really filled me cheer. 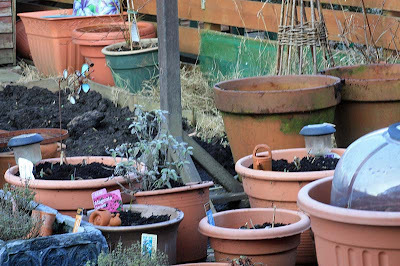 Here are a number of the pots all cleared of weed and emptied of soil. In the two large pots at the back which we inherited from Ds Dad, we will probably grow some new potatoes. In others dwarf climbing green beans. I know its probably late, but I finally got round to planting some Thermidrome garlic in long containers. Lets see how they do. My hanging baskets have been replaced by brand new wood fibre lining, as the birds, namely the magpies had stolen pretty much all of it for making nests. I don't begrudge them. I understand, but they didn't need to make a mess of it. It really did look tatty, looking almost like a mad professors haircut (look at the one at the back), but now these have all been replaced you'd be none the wiser. Question is how do I keep the birds from doing it again?! 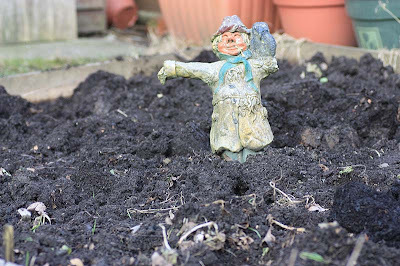 The garden plot soil has also been turned over with the worms. You could hear the birdies in the background getting excited. 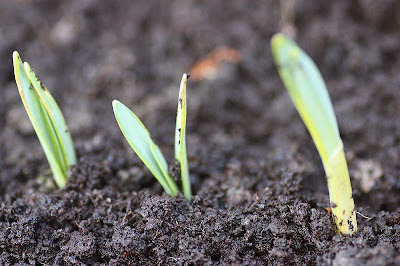 A little sunshine at the weekend and few good hours in the garden has got us motivated to start growing again. But it also reminded us of all the things we had lost and need replacing: money to spend. I didn't even have a secateurs to cut down some of the dead plants and used scissors, and if I am to grow veg, I need to get some seed pots. Oh well, at least we are looking forward too. I kept the best looking cavolo nero. I know exactly what I want to make with this. But before that, time to look in my 'seed box' and start planning on what I can realistically grow in my small space. Gosh, you have been busy this weekend! Looks like a fresh start. Your kale is inspiring and I look forward to hearing what you do with it. I'd recommend Freecycling btw - I got most of my tools free that way when I first took on Plot 35. Glad the sun was out for you too. It's looking good and bigger than I expected. We spent a few hours trying to sort out our much neglected plot yesterday and managed to get our potatoes in amongst other things. Wow, you got a lot accomplished. I thought I had a lot of pots, but you have me beat;) I can't wait to go out and play in the dirt, but it's a little too early here, we will probably get a few more snowfalls. Growing something in a tiny garden is still better than growing nothing at all. You'll make the most of that space. Cram it all in there! from the glimpse of your haircut i think it looks very sweet. here's to new beginnings of many kinds! 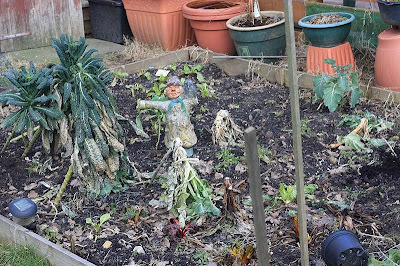 Sorry to read about your allotment, such a shame. Your garden is going to look great, all those gorgeous big pots you have. Exciting! This looks like the exact weather we are having. 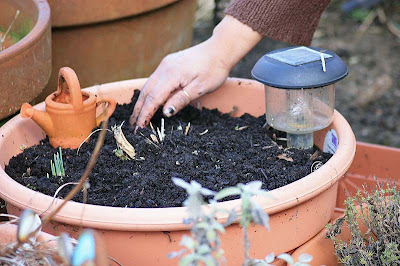 The potential of spring is inspiration to get out in the garden. I did some clearing, weeding, and lopping yesterday. I was surprised to find a huge bunch of oregano all ready to go. But my rosemary is barely alive?? I have to attack my pots this week. Hey great work. I spent yesterday in the garden, now the sun has arrived it finally feels like things will happen though our ground is still frozen solid. Another week of sunshine would make all the difference, here's hoping. 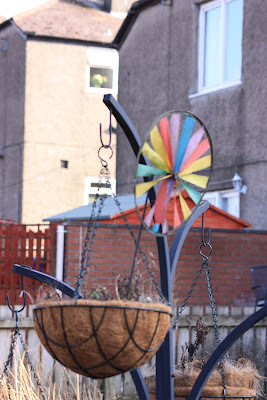 Wow, what a lovely little garden and I can see already that it is going to be very productive and a picture. 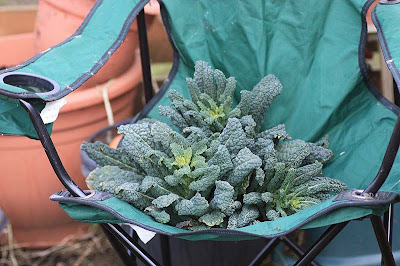 Can't wait to see what you make with the kale- shame on my, I have some and not used it - fed it to the chooks but do have lots more. You were busy busy! We have been busy all weekend too! We even got alot of root veggies and onions and more lettuces and chard in the ground! Everything is ready when the temps get warmer for all my seedlings I am growing indoors. I look forward to seeing future pictures of your garden! Happy Gardening! 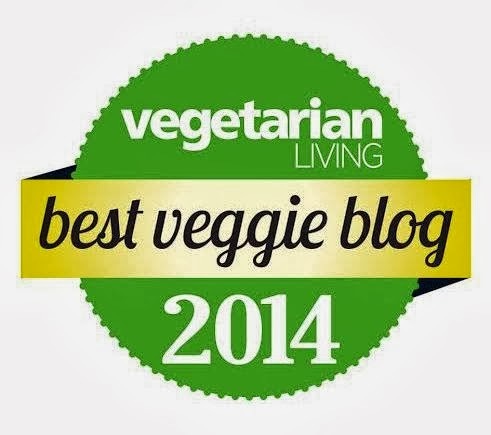 Just have had a catch up on your blog and love all the photos recipes and exursions that you have written up. Am finding it interesting to see how you are going with a veg box - I have not really done it - except a short go at it in a student household that was rather odd - but every now and again I think maybe I will. 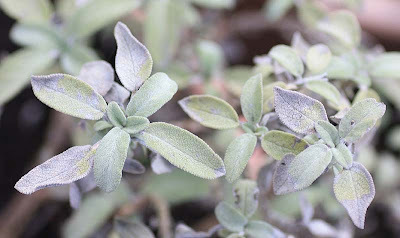 Gardening is such a lovely hobby, especially when you're planting herbs and spices for the kitchen. Good luck with your planting! How great to see you get going again. The bird mainly house sparrows decimate my hangong basket liners too. My biggest headache from gardening in containers is the waterring, I always either forget or don't do it often enough, so the plants alway suffer. 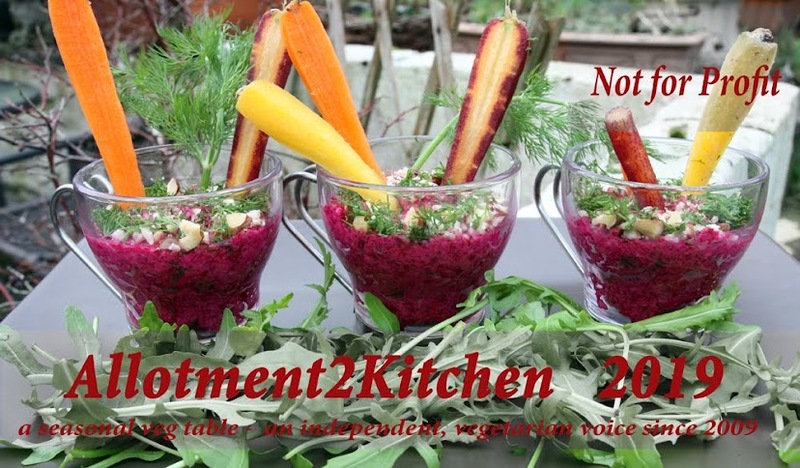 I look forward to seeing what you grow and the lovely dishes you'll turn them into this year. You've made a good start. You must have mixed emotions about starting this season with the changes your making and why. I'm sure you'll get a great harvest from your garden. 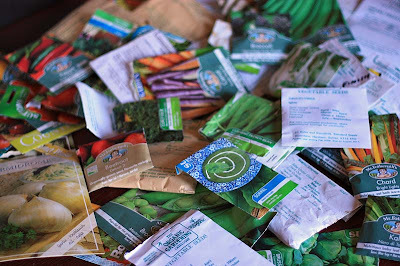 This post reminds me to start planting again :) Nothing like growing your own food. I certainly have been and I am feeling it in my bones! I actually made some soup with the kale yesterday. Promise to post it later in the week. Thanks for recommending Freecycling. I am signed up to it and had only got paving slabs for the plot, this year I will be looking out for gardening stuff. Thanks for reminding me to check it out again. It won't be on the same scale as the allotment plot, but it will serve us well for now. Mmm potatoes, I must get some next weekend. In Scotland they say 'Plant spuds on St Patrick Days and harvest them on King Billys day' ahhh the Scots. I will probably grow some new potatoes this year. Thank you Janet. Yes I am quite pleased with what we accomplished beteen the two of us. Once we get started, were pretty good. 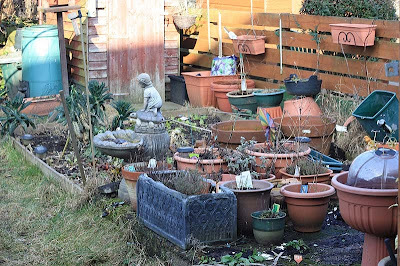 Yes, I agree I do have a lot of pots, accumulated before I got the allotment plot. I'll be making use of them this year. Hopefully we've seen the last of the snowfall here, but we can still have some more. Enjoy what is left of your snowfalls! I completely agree with you Ribbit. I am going to do my best cramming what I can in. Thank you so much Pia K.
Thank you still, it is most appreciated. 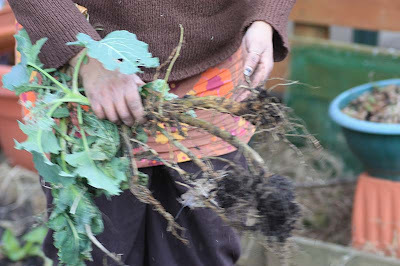 The weather certainly has got many of us out in the garden or allotment to do some 'clearing, weeding, and lopping' as you say. Nice to find some of those little surprises, especially if its edible! Sorry about your rosemary, hopefully it will perk up. Yay for the sunshine. I hope it stays around for a little while and softens your ground. Thank you so much Lottie. I am hoping to make the most of my little space this year. 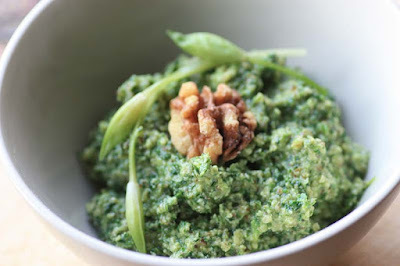 So you know, I actually have cooked with the kale, its a soup, but one I think you will approve of. I'll be posting it later in the week. Hopefully next time, you'll try some in a recipe for yourself and not give it all it to the chooks :D Maybe this soup recipe will tempt you. I hope so. Certainly sounds like you've been very busy too! I'll be over to have a good nosy round. Yes, that photograph made me smile too. I had not realised D had taken that until it was downloaded. How could I not put it on. I have been thinking seriously about the Veg Box. And am getting second thoughts whether or not it is going to work for us, but were still thinking. Soup is a good way to use the cabbage. I have half remaining still, so I may just end up doing that. Thank you. I am pleased with the kick start too. Tryng to look forward. Thank you. When my hair was long, it was wavy, now short its curly wurly and sometimes I get natural ringlets. I love it, makes me feel girly squirly and dare I say it cute. 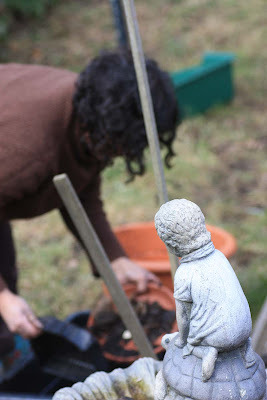 Though my body is ageing and is far from cute :D.
My husband gets annoyed with me, but I do prefer working without gloves, as I like to feel what I am working with. My nail growing days went out the window a long, long time ago. Ah we share the same problem with pesky birds decimating our hangong basket liners. Nature. I haven't had problems watering my pots and containers, as it rains pretty regular where I live :D but I sympathise with you and those thirsty plants. Yes it was a perfect gardening day yesterday Sooz. I completely agree with you. I look forward to seeing what you grow too. Your completely right I do have mixed emotions about starting this growing season and the changes of course still hurting me. But I/we have to try and look forward, no point looking backwards at what once was. Will try and make the most of what we have now. Even if its just herbs from the garden or a few salad leaves, I so recommend growing something. I'm so relieved to see you have a garden and will watch with anticipation as you transform it over the next few months. You may not be able to grow as much but I foresee great rewards for you and D in other ways. Your comment is so welcome. I just wish I had more space as I'll be limited at what I can grow this year in the space I have. All my kale is gone now, so I have just planted some. Parts of Scotland are really lovely, hence the reason why Scotland has a whole business built on it called tourism. Thank you so, so much Nic.